Kadavu is off the beaten track from Fiji’s mainstream tourist attractions and is an ideal location to experience true Fijian culture. The villages in Kadavu are conservative, maintain strong cultural values and lead fairly subsistence lifestyles due to the isolation of the communities, offering a glimpse of everyday Fijian lifestyle. There are very few roads on the islands and here you can escape modern life and witness Fiji’s incredible natural beauty. Kadavu was once known for the whaling station at Galoa Harbour, and as a port of call for steamers bound for New Zealand and Australia. Back in the 1800’s,Kadavu had its fair share of scoundrels and ruffians, such as local legend Vedori, who in 1838 ransomed the entire crew of a ship for items such as whale's teeth, axes and a case of pipes. Today, Kadavu is an eco paradise! Completely unspoiled and undeveloped, the Kadavu islands are renowned for diving and are home to the world-famous Great Astrolabe Reef. There’s plenty to see inside the islands too, including rainforests, birdwatching and guided sea-kayaking tours. The Kadavu Archipelago lies 45 nautical miles south of Viti Levu, Fiji’s main island. Kadavu Island is the fourth largest island of Fiji and is a 45 minute flight from Nadi or a 30 minute flight from Suva. Ono Island is the second largest island in the group.The Great Astrolabe Reef is the world’s fourth largest barrier reef and is Fiji’s largest living organism. It stretches for over 120km along the entire southern side of Kadavu and to the east of the island, over Ono Island. 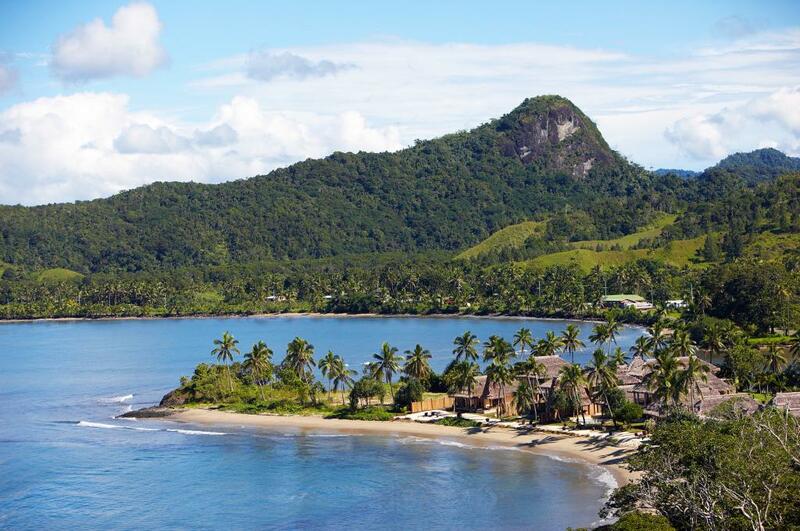 Sleepy coastal villages in Kadavu are dwarfed by rugged, mountainous jungles and waterfalls. Beautiful bays, palm fringed beaches and narrow isthmuses are surrounded by fringing coral reefs and mangrove forest providing a habitat to a host of birds. Kadavu is surrounded by the Great Astrolabe Reef on which you can participate in many water activities. The area is well suited for scuba diving and snorkelling. Swim and dive with Manta Rays, through coral gardens and around deep water pinnacles. Fishing, surfing and kayaking are also popular activities. Further inland you’ll find lush, green rainforest filled with stunning birdlife and glorious waterfalls, for birdwatching, waterfall and rainforest hikes and village visits. Kadavu can be dived all year round. The winter months of August to October brings the best visibility, however surface conditions can be choppy particularly on the south coast. Water temperature at this time of year ranges between 23˚C-24˚C. November to April sees the most rainfall but the water will be warm (28˚C-30˚C). However, with generally northerly winds at this times, the south side of the island remains drier and calmer. There is a resident, year round Manta Ray population and a feeding station at Manta Reef. The Great Astrolabe Reef runs along the south coast of Kadavu Island and loops to the north east around Ono Island and back to the east coast of Kadavu Island, making the area one of Fiji’s premier dive locations.The large reef stretches for some 120 kilometres. Rich ocean currents flowing through five passages in the Great Astrolabe Reef feed the waters resulting in extreme biodiversity of coral structures and marine life. The southern Astrolabe Reef area houses manta feeding and cleaning stations and is often frequented by reef sharks, rays, large grouper and schools of barracuda, sea snakes and ribbon eels. The reef boasts colourful banks of hard corals, steep drop-offs and submerged sea mounts. The dive sites on the north side of Kadavu Island are very different from those on the south side. Here you will find fringing reefs with soft coral bommies and pinnacles presenting easier diving. From Ono Island, divers can access sites on the Great Astrolabe Reef and lagoon dive sites.